Adrian Beck writes funny, action-packed adventure stories for kids. 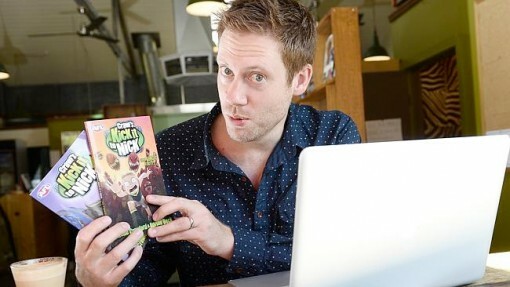 Adrian is the author of the best-selling Alien Zoo series and the co-author of the best-selling kids’ series Kick it to Nick, with AFL Hall of Fame inductee Shane Crawford. He has also written Stuff Happens – Dale, which tells the story of a redhead who gets teased once too often and plots revenge. All of Adrian’s stories are fun to read – even for kids who struggle to get interested in books. Adrian was born in Hobart, Tasmania but is not related to Princess Mary. (As far as he knows). He is passionate about raising childhood literacy levels across the country and is a fierce supporter of the endangered teacher-librarian species. Adrian is a part-time TV producer / part-time writer, and uses both skill sets to deliver entertaining schools visits with lively, humorous and interactive sessions on writing, working in television and sport. If you would like to enquire about Adrian as a speaker, please head to the Booked Out website.